In a medium-sized bowl combine Permesan cheese, bread crumbs, butter, and mayonnaise. Add lemon juice, basil, pepper, onion powder, garlic powder, and celery salt to mixture. Set aside. Cover a cookie sheet with tin foil and spray with cooking spray. Arrange fillets in a single layer on the prepared pan and generously sprinkle Old Bay seasoning over the top only. Broil a few inches from the heat for 2-3 minutes. Flip the fillets over, sprinkle on the Old Bay seasoning again, then broil for a couple more minutes. Remove the fillets from the oven and pat about 3 Tbs. 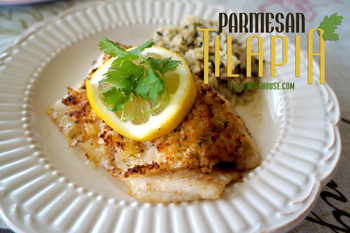 of Parmesan cheese mixture on the top side of each fillet. Sprinkle with paprika and parsley. Broil for 2 more minutes or until the topping is browned and fish flakes easily with a fork. Don’t overcook. This entry was posted in Recipe and tagged Dinner, Seafood.